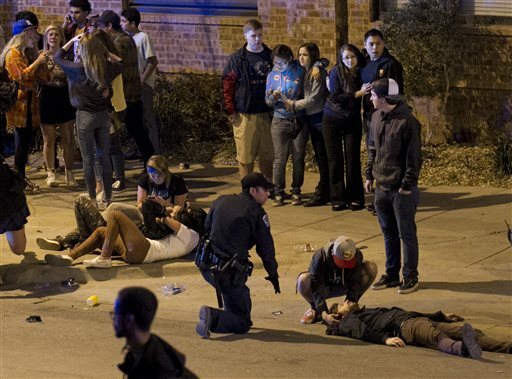 Rashad Charjuan Owens has been identified as the suspect who is believed to have plowed through temporary barricades near the SXSW music festival in Austin, Texas early Thursday, killing two and injuring 23 others. Owens, 22 and of Killeen, was identified by the Austin Statesman. The sudden crash shocked bystanders and photos shared from the scene immediately after the crash showed bodies on the ground and people crying. Dozens of people were waiting to get into The Mohawk to see Tyler the Creator as part of South by Southwest, the music festival. Austin Police Chief Art Acevedo said that Owens, who is in custody, will face two charges of capital murder and 23 counts of aggravated assault. One of the victims, a man from the Netherlands, was riding a bicycle when he was hit. The other dead person was an Austin woman who was riding a moped. The man on the moped is in stable condition. Five of the injuries were termed life-threatening. All of the injured were quickly transported to area hospitals. Owens took off from a drunk driving stop going the wrong way down a street and plowed through the barricades, trying to run from police.